Infiniti EX fuel consumption, miles per gallon or litres/ km. Find out how much fuel consumed litres/ km or miles per gallon a Infiniti EX. From year: 2002, 2003, 2004, 2005, 2006, 2007, 2008, 2009, 2010, 2011, 2012, 2013. How much fuel consumed Infiniti FX 3.5 l, liters / 100 km or miles per gallon. Infiniti FX 35 it is a SUV. Car max power: 284.00 PS (207,96 kW or 278,60 HP). How much fuel consumed Infiniti FX 3.5 AWD, liters / 100 km or miles per gallon. Infiniti FX 35 AWD it is a SUV. How much fuel consumed Infiniti FX 4.5 AWD, liters / 100 km or miles per gallon. Infiniti FX 45 AWD it is a SUV. Car max power: 324.00 PS (236,81 kW or 318,40 HP) at 6400 Rev. per min. How much fuel consumed Infiniti FX 5.0 AWD, liters / 100 km or miles per gallon. 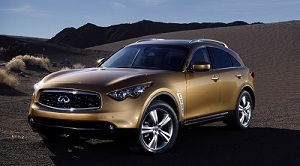 Infiniti FX 50 4WD it is a SUV. Car engine capacity: 5019 ccm (304,73 cubic inches). Car max power: 395.00 PS (289,55 kW or 388,05 HP) at 6500 Rev. per min.